Jerry Gale Jones, esteemed Portland businessman, philanthropist, spiritual seeker and meditation teacher, peacefully passed away on December 29, 2016, at his home in Ojai, California. Jerry was a lover of art, design, literature, and the outdoors. Whether jogging on the beach on an early summer morning, skiing the slopes of Mt. Hood or Mt. Bachelor, or backpacking in the Wallowa Mountains, he had a lifelong love affair with Oregon’s outdoor wonderland. 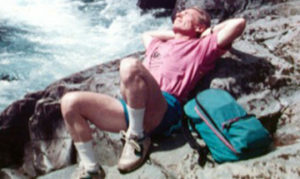 Physically active and athletic most of his life, Jerry was a member of The Multnomah Athletic Club for almost 50 years and an early proponent of organic foods. He loved to learn and experience new things, and his sincere, open-minded interest in people and places served him well throughout his full life. Jerry’s love for the outdoors and open spaces was what drew him to the Ojai Valley Land Conservancy. He enjoyed spending time on the trails with his family. After his passing his daughter Shannon wrote to us saying hiking on conservancy lands with her father are some of her happiest memories in Ojai. Jerry wanted to ensure these special places would be cared for forever and to do this he remembered the OVLC in his estate plans with a generous bequest of $100,000 to our endowment. For those who knew him, Jerry set an inspiring standard for honesty, forthrightness, and integrity. These qualities opened doors for him in business and fostered a spirit of philanthropy and leadership in others. He will be remembered as a quiet, deep, hardworking, kind and generous man, a loving friend and father, and he will be greatly missed. In his outline of final wishes, Jerry wrote, “As the Robert Frost poem says: ‘I want to be all used up when I die…’ I tried to live my life that way, fully and richly as possible. So mourn not for me, celebrate!” The community of Ojai will celebrate Jerry for many years to come every time they hike on the OVLC trails. There is something compelling about the notion that a gift at a person’s passing can give life and renewal—not just for a short time, but forever. Remembering the Ojai Valley Land Conservancy in your estate plans ensures the open spaces you love in Ojai today, will be protected for current and future generations to enjoy forever. 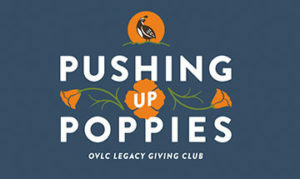 The Ojai Valley Land Conservancy is proud to announce the launch of Pushing Up Poppies­—OVLC’s new legacy giving club. It honors, thanks, and recognizes those who have included the OVLC in their estate plans. Members will be invited to Pushing Up Poppies Legacy Giving Club events, and enjoy special benefits at upcoming OVLC events. If you have made your plans known to the OVLC, you will be receiving information soon about the Pushing Up Poppies Legacy Giving Club. If you have included the OVLC in your estate plans, but have not yet shared this information with us, please let us know. We would love to hear from you and learn why Ojai is important to you. Your legacy gift, along with many others like yours, will keep the Ojai Valley’s views, trails, water, and wildlife protected for future generations! Inspire and influence others by letting us know about your planned gift today. Interested in joining or need to update your recognition preferences? Contact Tania Parker, Director of Advancement today. (805) 649-6852 x6 or tania@ovlc.org. You can also join or update your preferences online at ovlc.org/pup.